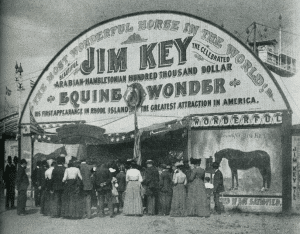 There are many small mysteries in the story of Beautiful Jim Key, but everyone who saw him perform seemed to agree unanimously: There was no indication of trickery by horse or handler. Jim was able to do math problems, spell names, share his political preferences, and retrieve a coin from the bottom of a large glass jar filled with water. Skeptical audience members could give Jim instructions and, without his handler’s involvement, the horse could fulfill the request correctly most of the time. The fact that he occasionally made mistakes only convinced observers that the act was authentic. Jim Key was sired by Tennessee Volunteer of trotter bloodlines and out of the legendary Lauretta “Queen of Horses,” an Arabian mare who was allegedly stolen from a sheikh in Persia and sold to P.T. Barnum to tour Europe as a circus performer. After her popularity began to wane, Lauretta was sold to low-rent circuses in the U.S. where she suffered mistreatment and neglect. William Key, the former slave, Tennessee businessman, and self-taught veterinarian, bought Lauretta and nursed her back to health. She became a useful marketing tool for Key: He traveled throughout the South peddling his Keystone Liniment as a cure-all for horses, and Lauretta was an excellent example of a horse that had benefited from the liniment’s properties. 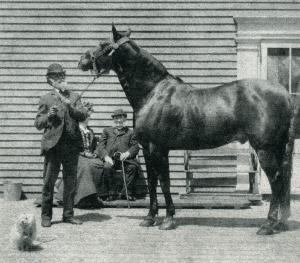 After Lauretta foaled a colt by Tennessee Volunteer in 1889, the mare’s health deteriorated rapidly and her spindly-legged colt essentially became an orphan. William Key originally intended to give the colt a biblical name, but the foal was so homely and clumsy that he simple called him “Jim” and gave him his own last name, Key. As with many other motherless foals, Jim became attached to his human caregiver and began to develop quirky, almost human-like behavior. Lauretta died when Jim Key was a young foal, but the colt hardly noticed because of his relationship with his breeder and owner, William “Bill” Key. Jim began picking up tricks he learned while watching Bill’s dog fetch sticks, sit, and roll over. The colt insisted on spending every moment with his owner, so he even slept on blankets in the Key family home at night. Bill’s wife Lucinda, who was tolerant of her husband’s unique relationship with the young horse, first figured out that Jim Key could answer yes or no questions. She was eating an apple in front of him when she asked, “Jim, do you want a piece of apple?” He nodded his head and up down in response. When Bill Key witnessed this behavior, he began tutoring Jim in politics, Bible passages, math, and the alphabet. The horse went on the road with him where they’d give impromptu comedy performances as part of Bill’s sales pitch for Keystone Liniment. Bill and Jim took their act to local fairs where they wowed the crowds with Jim’s ability to spell short words by putting letters on a rack in the correct order. 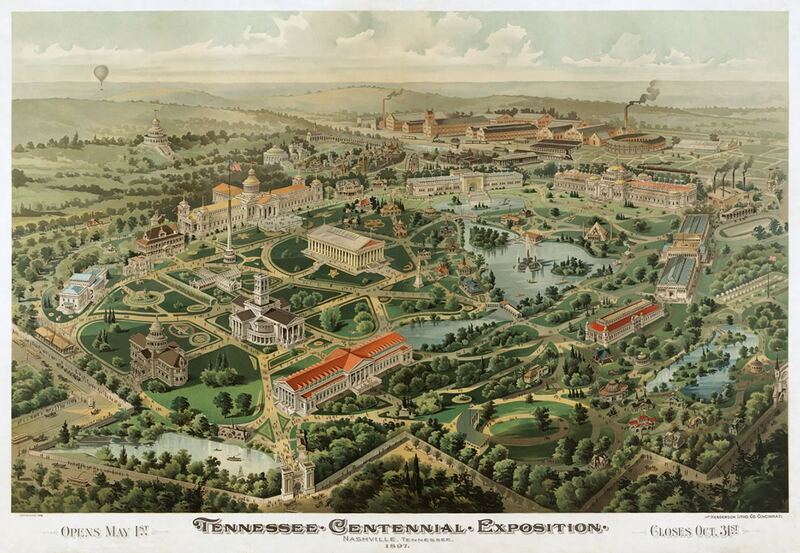 The Tennessee Centennial Exposition of 1897, where Jim Key made his debut and promoter Albert Rogers first saw him. Rogers was determined to make the horse and his handler stars. Elsewhere at the fair the entrepreneurial Albert Rogers was operating his own attractions, a log ride and a giant seesaw. When he read McKinley’s comments, he went to see Bill Key’s amazing horse and became determined to buy him. The two struck a deal where Rogers would become Jim Key’s promoter and owner in the public’s eyes, but in reality would remain Bill Key’s horse. Rogers arranged for Bill and Jim to appear at venues throughout the East and even developed a two-act play called The Scholar and a Model Office Boy that the duo performed in theaters. Rogers’ ambition was to become respected in humane circles, so he appealed to animal protection organizations to sponsor the act on the road. It was a challenge to get their support however, because many humane activists viewed the act as either a weird sideshow or a hoax. Rogers made an effort to explain to anyone who would listen that Beautiful Jim Key’s message was that with kindness, animals can be taught to do anything. Still, there were plenty of skeptics. Jim Key on stage spelling the name of celebrity Greyhound, St. Elmo. In the background are names of politicians, which Jim would retrieve at the request of audience members. From Beautiful Jim Key. Testimonials from prominent Americans helped, especially those from John Philip Sousa, a group of Harvard professors who studied the act, and George Thorndike Angell, the founder of the Massachusetts SPCA and champion of the novel, Black Beauty. 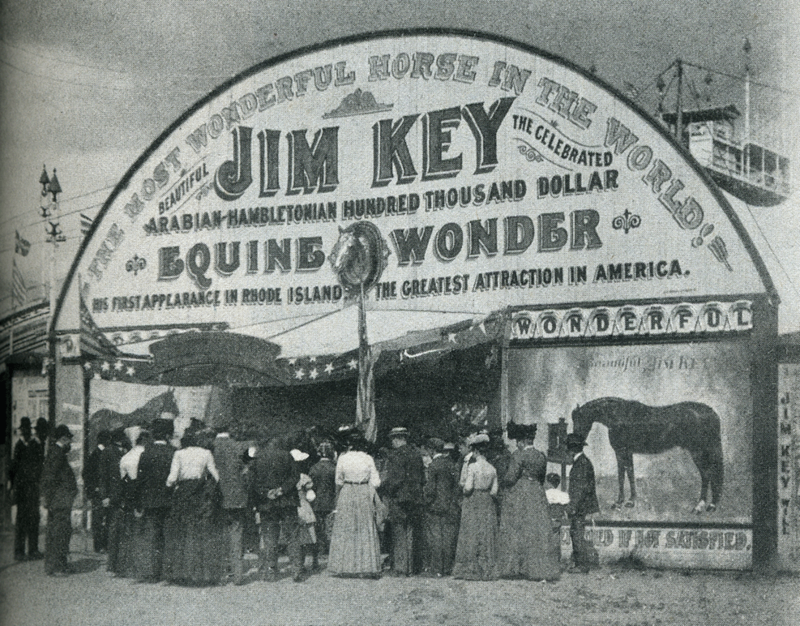 At the height of their success Bill and Jim Key performed at the 1904 St. Louis World’s Fair, where Rogers boasted that their act was the most profitable of the entire exposition, and toured throughout the Midwest. Over a million people had joined the Jim Key Band of Mercy, a club that facilitated social circle discussions about the humane movement, and more than a million children signed the Jim Key Pledge stating they would be kind to animals. Jim Key had even become popular enough to have a dance step named for him, the Beautiful Jim Key Two-Step. But the duo was slowing down with age: Jim was arthritic in his upper teens and Bill was in his 70s. Plans were made for the act to rest all of 1907 and return to performing the following year, but Rogers went through financial hardship and Bill Key’s health continued to decline rapidly. Rogers had a falling out with the American Humane Education Society and the Massachusetts SPCA and was forced out of his official roles in those organizations. He spent much of his time trying to restore his reputation and rebuild his business. 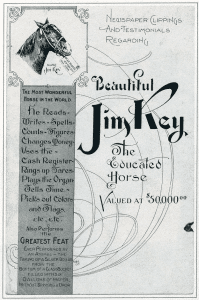 Back in Tennessee, Bill Key died in 1909 and Beautiful Jim followed in 1912. 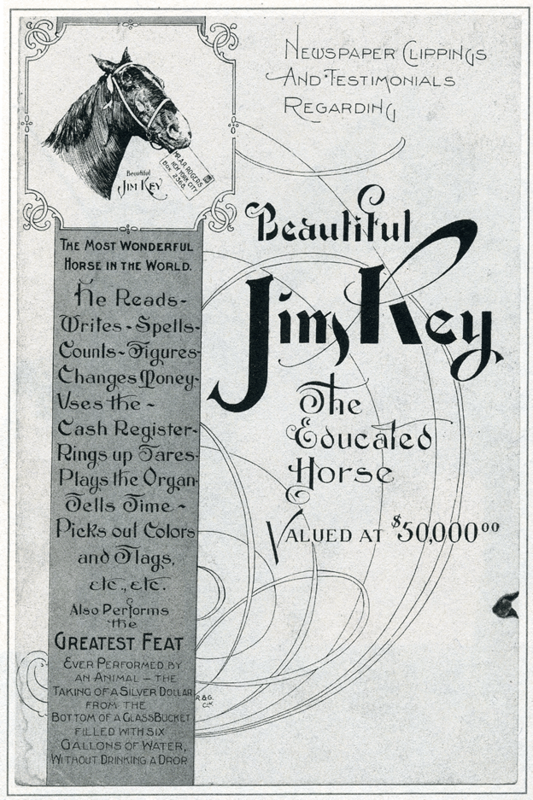 A promotional packet boasting Jim Key's value at $50,000, designed by Albert Rogers. From Beautiful Jim Key. Much of the story was lost to history, with occasional bits of it being revealed in newspapers over the next 50 years. A few Tennesseans had hazy memories or had heard second-hand stories about the educated horse and his handler, and eventually one local uncovered two old steamer trunks that belonged to Bill Key and contained a wealth of information. In 2003 a group of people interested in the story of Beautiful Jim Key gathered near the site of Bill Key’s Shelbyville homestead to share stories and collaborate on Rivas’ book Beautiful Jim Key and a forthcoming documentary. The book is a long read with extensive details about Civil War events, politics, East Coast society, changing technologies, and the business world at the turn of the 20th century. At times the story goes off on many (well-researched) tangents, but the author, Rivas, remarked in the acknowledgements that after working with documentary maker David Hoffman on materials for the book, she felt every detail was necessary to put the story in context. In that respect, the book paints a clear picture of society and how Beautiful Jim Key and his handler Bill Key were groundbreaking characters in history. While they may not be readily remembered today, they played a role in furthering the humane cause and integrating the post-Civil War South. Was Beautiful Jim Key a hoax or the real thing? No one was ever able to prove the act was fake, or that the horse was taking cues from his trainer instead of following the audience’s instructions. I was a skeptic myself, but after reading the book, learning about Bill Key’s training techniques, and knowing what horses are capable of understanding, I think it might be an authentic story.